The body that governs the sport of chess has a nifty statistical tool. This tool provides a rating to registered players—any player, any age, any level, any country—that effectively gives them a world ranking. Termed an Elo rating, it enables comparison across levels and, to some extent, even across time. Thus, say, a 12-year-old Indian girl living in Chennai and playing weekend tournaments can see the movement in her Elo rating. 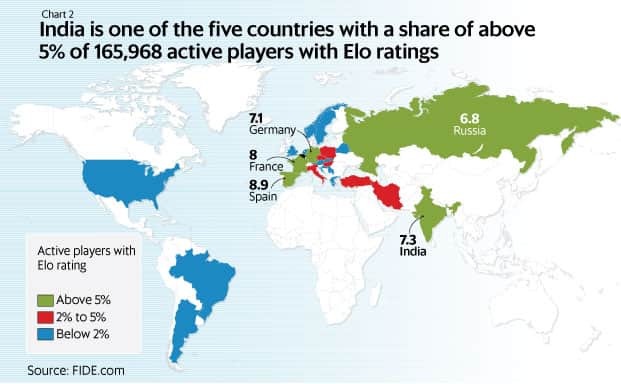 According to the World Chess Federation, as of November, there were 165,968 active players with Elo ratings in the standard format (the equivalent of test matches in cricket, as opposed to shorter time formats). Among them are Magnus Carlsen and Fabiano Caruana, the two players with the highest Elo ratings who are currently deadlocked in a world championship duel. There’s five-time world champion Viswanathan Anand, who captured India’s imagination and catapulted chess in the country to another level when he became its first grandmaster at the age of 18 in 1988. 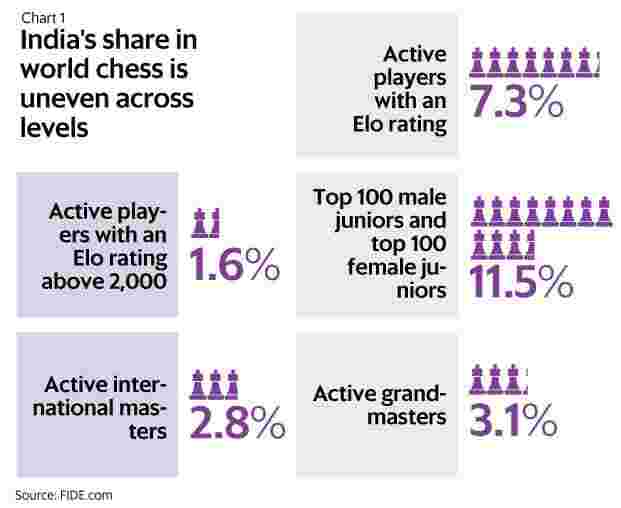 There are 12,153 Indians, male and female, with an Elo rating, or 7.3% of all active players. 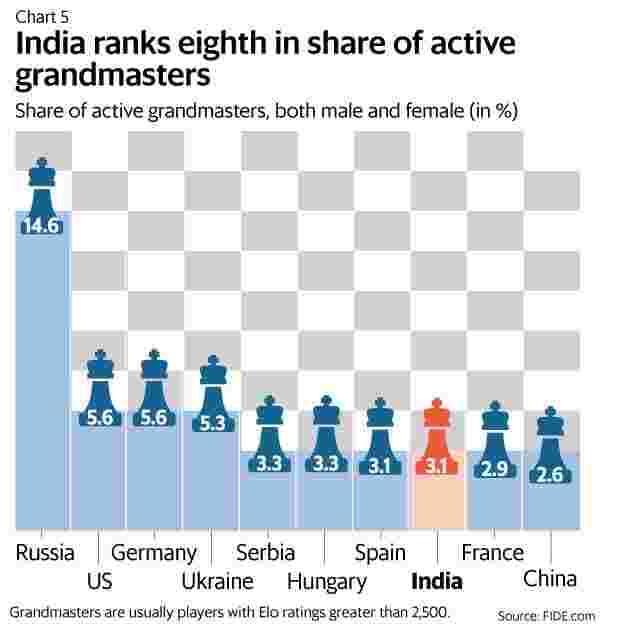 For a country credited with origins of chess, but which was a latecomer to the sport of chess as it looks now, it’s a telling statistic that the number of active Indian chess players on this database is next only to Spain (8.9%) and France (8%). By comparison, the share of active players from Russia is 6.8%, the US 1.5% and China 0.6% (chart 2). In other words, there are many chess players in India who like to see their performance distilled into a single number that can be compared and tracked. This partly comes from the novelty of having a world ranking. In terms of average Elo rating, India is fourth from the bottom, ranked 181 of 185 countries. But it is also, in some measure, a demonstration of intent, of wanting to compete in chess. A measure of competitive intent, craft and commitment is an Elo rating of above 2,000. Back in January 2001, the oldest year for which data is available and the year following Anand’s first world title win, there were 656 active Indian players with an Elo rating of above 2,000, or a share of 2.3%. In November 2018, that number had fallen to 488, or a share of 1.6%. During this period, the total number of players in the world with an Elo rating above 2,000 has increased marginally from 28,936 to 30,253. 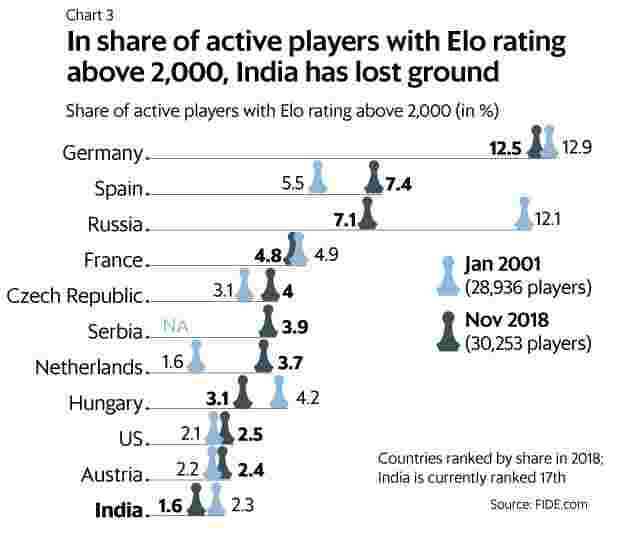 In other words, for India, there is a drop between players taking to chess and persisting till the beginning of the competitive bracket.While India has lost share at the Elo 2,000 level, several European countries have gained, notably Spain and Czech Republic (chart 3). However, at higher levels, Indians are making their presence felt. Take the world juniors (under 21 years). Among male juniors, as of November 2018, there were 12 Indians in the top 100, next only to Russia (14). 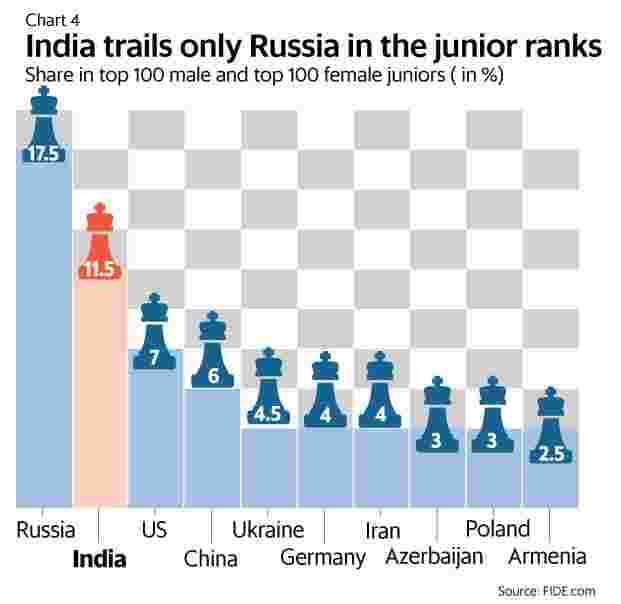 Among female juniors, there were 11 Indians, next only to Russia (21) (chart 4). That said, the junior ranks in chess can be like tennis and cricket, where the top juniors don’t necessarily lead in transiting to senior ranks. One Indian who made that transition, and is still making his presence felt with his longevity, is Anand. Aged 49, he is currently ranked eighth in the world. Among the top 100 players in the game today, he is the third oldest. To put this in context, the average age of the other nine players in the top 10 is 30 years. Anand has lived through three eras of the sport. There was the era of Russian dominance, whose flagbearers were Garry Kasparov and Anatoly Karpov. Anand took the baton, and became the figurehead of a time when chess became broader, younger, faster and cooler. Today, the likes of Carlsen and Caruana are doing more of that. Anand has been a vanguard for chess in India. So much of the increase in player numbers, tournaments, sponsorship and awareness about chess in India intertwines with his journey. Today, India is ranked eighth in the count of grandmasters (usually players with Elo ratings above 2,500), male and female (chart 5). In 2000, when Anand first became world champion, India had five grandmasters. It now has 53. It then had 1 player in the top 100 for men, now it has 6. It had 1 player in the top 50 for women, now it has 3. India is registering strong numbers in the lower and upper-middle echelons. But, at the very top, it is still waiting for another Anand.